a Wise Magician’s Ring! This ring gives 3 to all stats, 2 magic attack, 10 defense, magic defense, and accuracy. If you are an Archmage, Bishop, or 4th job Flame Wizard you get an extra 5% critical chance. 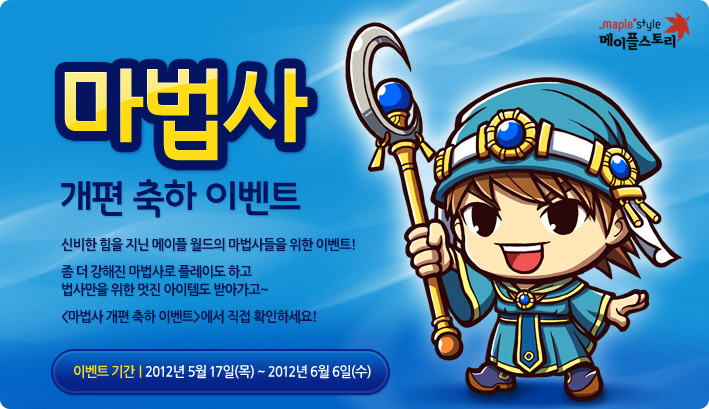 If you are a 3rd or 4th job mage, you’ll receive an extra 2 INT and 1 magic attack. This ring can be traded through the account once with the Share Name Tag. At level 70, newly created mages w ill receive the Enlightened Magician’s Marble! After killing 3000 monsters, you’ll get not one but two items! The Wise Magician Wand, which gives 100 HP and MP, 57 attack, 93 magic attack, 10 accuracy with 7 slots. If you’re level 98 or more, you’ll get an extra 12 attack and 20 magic attack. 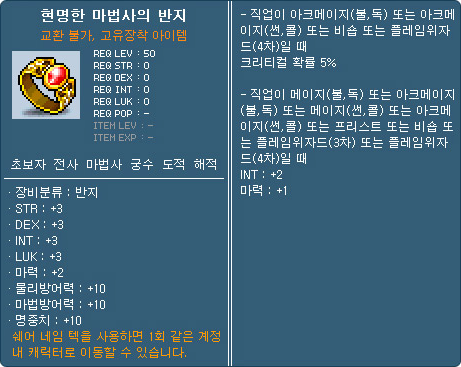 You’ll also get the Onyx Dragon Staff which gives 100 HP and MP, 62 attack, 95 magic attack, 10 avoid with 7 slots. If you’re level 100 or more, you’ll get an extra 9 attack and 20 magic attack. Like always, mages will receive equipment boxes at the above levels. Also, based on your level, you’ll be asked to get a certain number of level ups! If you can complete this task, you’ll get 60% One-handed Weapon for Magic Attack Scroll (+1 INT and 2 magic attack) and a potion that gives 10 to all stats and speed for 1 hour. 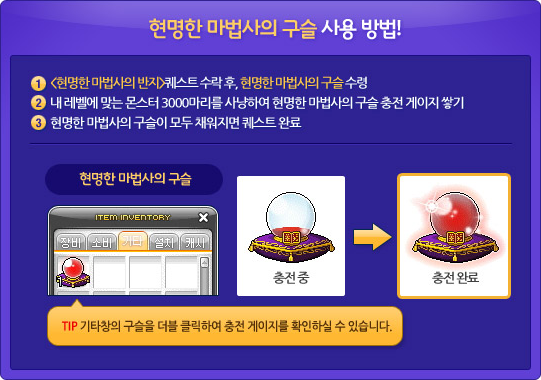 To magicians who job advance during this event, they’ll receive prizes! 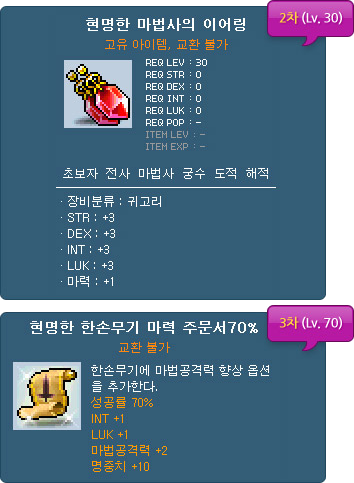 At 2nd job advancement, the Wise Magician’s Earrings, which give 3 to all stats and 1 magic attack. At 3rd, they’ll get a 70% One-handed Weapon for Magic Attack Scroll, which gives 1 int and luk, 2 magic attack, and 10 accuracy. 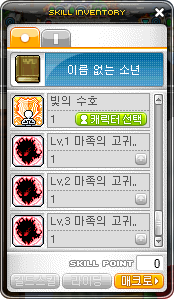 At 4th, they’ll get a Special Mastery Book! A small change was made to monster HP bars this patch. Now, when you attack a monster, the damage you have done will be shown on its HP bar in red, and will slowly fade away. Sorta cool I guess. 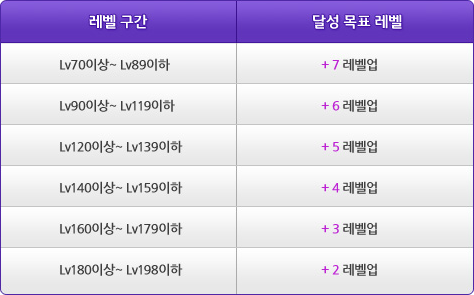 New level 99 Maple equipment and weapons were added, called Premium Maple Iolet items! 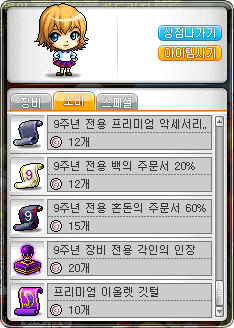 They have slightly better stats than regular Iolet equipment, and can be bought from the Premium 9th Anniversary Shop (run by Starry)! You can see their stats here (thanks Fiel of Southperry!). 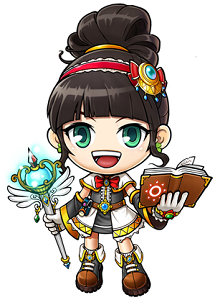 A new Maple Iolet Ring (3 to all stats, 1 slot, level 30) and Premium Maple Iolet Ring (5 to all stats, 1 attack and magic attack, 1 slot, level 50) have been added! They can be worn together, and if you noticed, they can have potential! You can convert your current level 79 items to Premium items by using the Premium Iolet Feather! 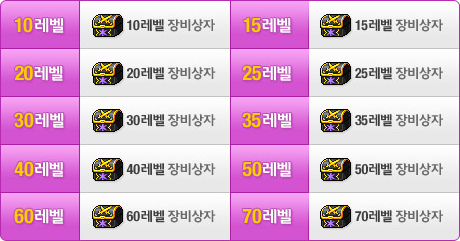 In addition, 9th Anniversary Equipment Only scrolls and 9th Anniversary Equipment Only Potential Stamps (if you don’t know what a stamp does, it adds a line to a 2-lined potential equipment at a specific % chance) have been added as well! The 9th Anniversary Celebration Box that drops from monsters can now give out Premium Iolet equipment, Premium Iolet Feathers, and 9th Anniversary Equipment Only Potential Stamps! P.S. the Demon’s Noble Blessing skill I mentioned in my last post was nerfed to 3, 5, and 7 attack for each level, so a total of 15 attack instead of 35, haha. Cheated to first again. noticed that the new patch mentions the Mage ring, would like to know what it does and does not stack with. thanks. Man, nice stuff. My senses were tingling so I knew you just added a new blog entry up, hehe. 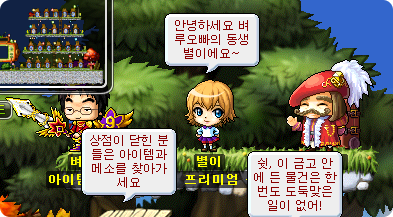 Kms anniversary > Gms anniversary by a lot. Having Maple equipment is nothing special these days. Another stab to the old Maple days. 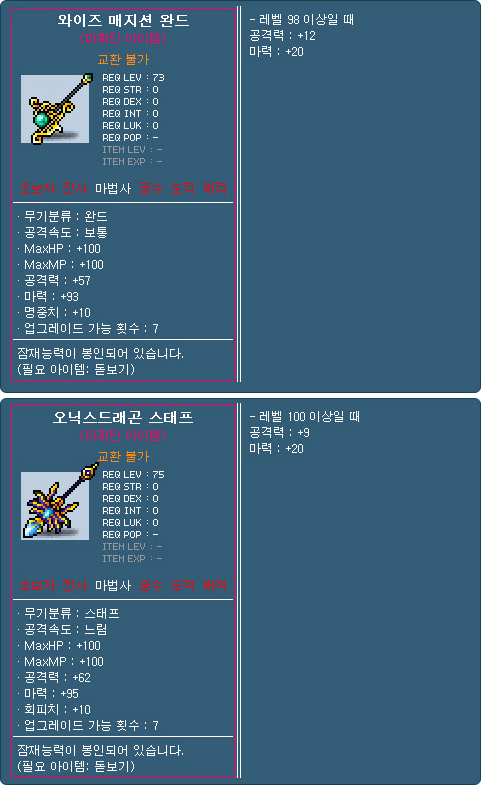 Are the staff and wand tradeable or do you need a Share Name Tag like the ring? 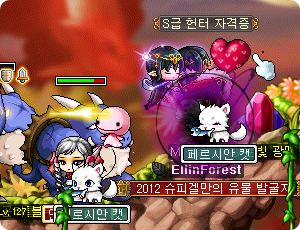 so Max, they added new Maple weps after their Mapleversary Patch went live?! Aw. I was looking forward to watching the world burn with 35 extra att. Sadness. They have 4. However, the 4th job skill book has no skills. 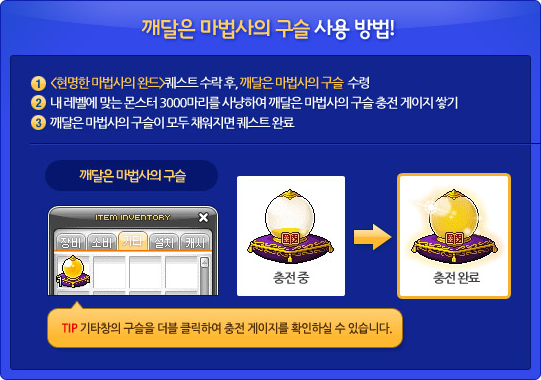 is 4th job blaze wizard 120 to get ring???? Does anyone know if Evans participate in this event? They blocked Evans from being created now, so no. also, a comment about a previous post. can the fantasticroid equip a lidium heart? how about a princessroid? Hey Max , want to ask you . Do this mean that all the Mage classes are balanced now? I want to know whether f/p is still over-powered or not? And last question, is BaM considered a good attacking Mage as a f/p? Did you use same equips for both your f/p and bam to check which one is better? True. It takes patience, I mean what do you expect from an Explorer-type class (they aren’t supposed to be like the Angelic Bursters and such). Either way, with the upcoming revamps f/p and BaMs are pretty much the same (most of the skills have nearly the same damage, etc). It’s just that F/p specializes in DoTs and Bams have higher dps. They should make the angel ray for Bishop faster like Hurricane! for the mage ring, does it have to be newly created character?? or can any mage get them regardless of their current level?